1. The soundtrack. One of the main songs is called "Mid Air" and they play it when the main character meets Rachel McAdams for the first time. The 2nd line of the song says "I want to live forever." I. Want. To. Live. Forever. This line hit me really hard. Of course, I have been so deep in sadness, I have days where I don't care if I die. I feel like I'm waiting. Every single day. I do NOT want to live forever at all. BUT, this line made me cry. Why? Because life, although it has recently shown me a dark/cruel side, in the past, has given me these beautiful moments where in that, I really did want to live forever-I mean things were wonderful. Of course, things are and will never be perfect till we leave this life, BUT it made me remember that my life hasn't always been this-this pile of filled tissues, day after day of puffy read eyes, flashbacks of my loss, this burning longing, this unrelenting jealously-No. I had wanted to get married for so long and the journey to the altar was a little rocky itself. The day Darren and I got married and for a year after that (till infertility became a member of our family), I could honestly say, I wanted to live this life forever. The lyrics in the song briefly reminded me of that. This led to Dar and I discussing, if you could relive a day in your past (and not change anything, just relive it) what would it be? There is something sweet about those moments/months/even years of our lives. When we are so happy there is no room for sadness. I'm putting the song on here, listen to it and if your in a rough place try to think of day or experience that made you so happy you truly believed living forever wouldn't be so bad. wondering the earth is sticking their tongue out at me-they are better than me. Their body is better because it can hold a child to term. They are better than me because they have the power to get pregnant on their own when they want to. I find myself angry that I have been dealt these cards. In the movie someone get's sick. I hate that I lost J and B at 18/21 weeks AND have to deal with infertility. But the excited couple who losses their baby full term because of a freak cord accident? But the mom that has to watch her toddler/young child die of cancer? The parents who get the late night phone call that their was an accident and their teenage isn't coming home? Or (I've witnessed this), the sweet mom of 4 beautiful girls after battling cancer for 7 years dies, leaving them all behind? Life indeed is a mixed bag for everyone. I have to process this, I have to. Just as I was celebrating the genders of J and B someone I'm friends with in the blogging world was losing her twins. While I was in the hospital fighting for Jude's life, another blogger friend texted me she is pregnant with twins. Highs and lows come to everyone at different points. 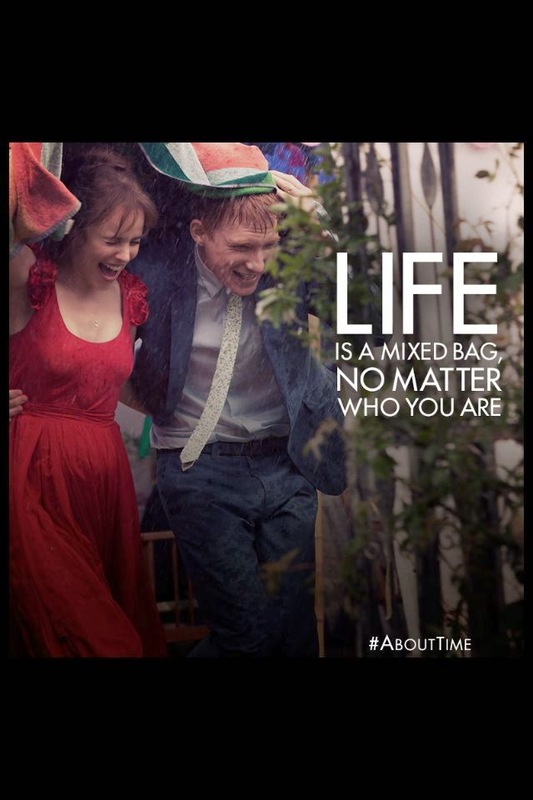 Life is a mixed bag. 3. To live each day without changing anything. The father and son are very close (the father can time travel too) and as they age, he gives his son some tips with his ability. To live each day, taking it as it comes whether good or bad, and then to always go back a relive that day again, without changing anything, but looking at it more light-heartedly. This got to me too. The movie shows the character just having a bad day-things go wrong at work, it's long, and he comes home exhausted. He follows his dads advice and returns to that day. But this time, he laughs a little more, doesn't stress out at much, and comes home and tells his wife "the day wasn't that bad." I wish I could do this. Really relish the beauty of each day. To shake of the little things that sting and to see the good. Once the movie was over, Darren noticed the tears (he LOVES to catch me crying in movies). The tears turned to sobs (he doesn't like me sobbing in movies-side note: one time in college I watched Man on Fire with him and cried for like 30 minutes afterwards, he had to set up Nintendo to distract me). The message of the film was so clear-to appreciate each day and that time does go on. As mentioned, I feel like I'm living in suspense. Since we have been trying to get pregnant I feel like I am waiting. There is such a huge piece of my heart missing. As a Christian I know that having a baby won't fill that completely but it sure will help take away this throbbing sorrow. It's easy for women without infertility to judge this. "enjoy it will happen" "relax, if its meant to be its meant to be" and of course my favorite "you can always adopt." The majority of us dream about having kids-to not be able to reproduce "on demand" goes against our very biological systems. It's in our cells this desire to want to carry a child, to experience creating a life. Heck, God even commands us too. So here I am having this spiritual, physical, and mental drive to do something 90% of women can do when they feel like it, and it is massively delayed. To grieve and wait at the same time is hard. I feel like I cannot "relish" each day because I'm trying to get through each day just to get to the next. I don't want to live like this but I accept it's where I am at. I'm 30. I can honestly say that in my 3 decades on this earth there have been more good times than bad. I'm in a dessert, I'm in a valley. I have to hold on that this isn't forever, I have to try to force myself to not miss out on the days of my life that are passing now, and of course tattoo to my brain that life is a mixed bag no matter who you are, not just Holly Lynn Benson. 4. Lastly, as so many women going through levels of IF share, the amazing love and support of our husbands. Some days Darren is the only reason I get out of bed. Although I feel so alone, I am not. My best friend, my greatest comfort. The true therapist who hears me repeat and repeat and repeat what happened. 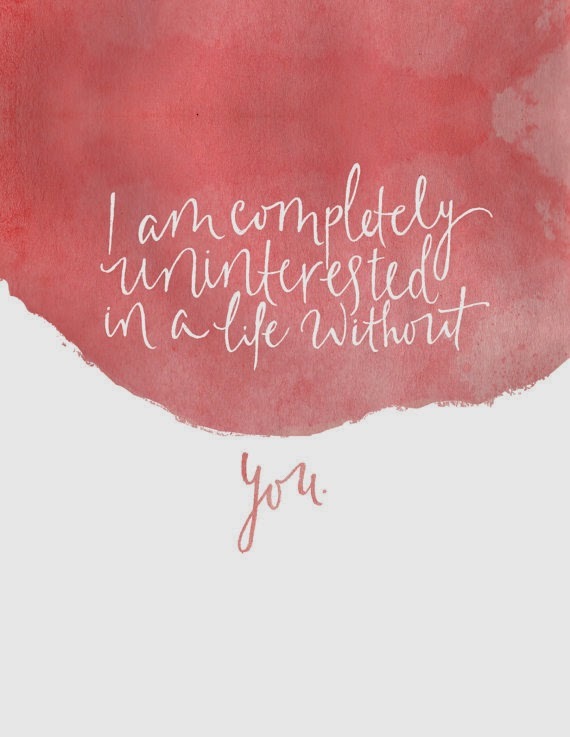 In the movie a wife whose husband is sick says, "I am completely uninterested in a life without you." I love this. I want to frame it. Sounds like a good movie! I will have to check it out!!! I'm glad you were able to relate to it! You are such a strong woman! I am reminded of this verse...."Return to your fortress, you prisoners of hope; even now I announce that I will restore twice as much to you." In life, the enemy throws us lemons, but God promises us through this scripture that He will redeem it and make it better...ultimately making us lemonade. I hold onto this verse when in those dark times and I'm not sure if it will help you, but I wanted to share it with you. I believe that God never leaves us in the mess the devil created, but pulls us out. I think that About Time is one of the sweetest movies I've seen- with so much to take from it. Praying for you as your continue to grieve and heal and love and live. I REALLY want to comment on this but it's really touched me and struck a cord with me.. I just don't have the words. No one expects to be the Mother of a dead child. No one expects to hear songs that are just simply played on the radio and break down and cry.. walk through a store and grimace in pain-- having to run to the bathroom and sob. I'm so sorry for your loss. I'm glad you liked the movie, and I love the quotes! The trailer looked nice and it has some good actors, but there was a delivery room scene, and I wasn't sure if I could handle that when it came out...so I didn't go to see it. But with all your praise we might see it now. It's so difficult to remember the positives in our lives when we are dealing with such heartache. Thanks for the reminder. Your attitude after all you have been through is truly inspirational. We too lost our sweet baby back in October. Finding strength and courage and energy to move on in life without our baby has been the most difficult part of my life by far. I appreciate you being brave and writing what you are going through -- I often read your words/thoughts/feelings as if they are my own. We just watched this movie too and it hit home more than I thought it would. I wish I knew what the right words here are, but I don't. I think it's wonderful that you were able to get so much from the movie and to remember the good times, even now when you're walking this dark road. I'm not sure that's something I could have done in the first few months after we lost our boy. Every time I read your posts, I want to hug you. Your strength is an inspiration...even though you may not feel strong right now. I love that saying about a mixed bag. Think you've convinced me that I need to rent that movie. Oh, Holly. I know you don't want to be in this place and would never have chosen it. I wish words were enough to change it all. But you are seriously handling it with such grace, it's unbelievable. It's evident that your heart is completely shattered, but it's also evident that you are a fighter and will continue to fight for the future of your family and Brinly and Jude 's siblings. Don't give up. You truly are a hero. A hero with a Mama's heart. Thanks for being so real and raw! It's good for me and probably everyone. I know what you mean about the crying. In college after I saw children of men I cried for at least half an hour and I had to go home and watch love actually to cheer me up. It's my go to happy filled with hope movie :) praying for you! !